On April 15, 1776, The Duchess of Kingston was brought to trial to face charges of bigamy in Westminster Hall. This scandalous display of aristocratic bad behavior – involving even the King himself – kept London buzzing for months on end. The reason the story was so compelling? The witty and charismatic lady at the center of it all. 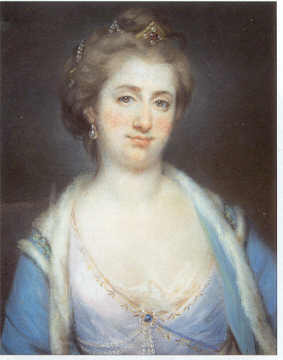 The Duchess of Kingston was born Elizabeth Chudleigh in 1721 to an old Devonshire family. Her father died when she was very young, forcing her to grow up in genteel, aristocratic poverty. Things improved considerably for Elizabeth in 1743 when she secured a position as a maid of honor to the Princess of Wales. Elizabeth quickly gathered admirers when she arrived at court. Before long, she met Augustus John Hervey, the future 3rd Earl of Bristol, and it was love – or lust – at first sight. Practically speaking, marriage wasn’t the best idea. Hervey was only bringing in 50 pounds a year and it could be decades before he inherited his earldom. If the couple wed, Elizabeth would lose her position as maid of honor – and the 200 pounds per year that went along with it. But their raging hormones won out, and they married on August 4, 1744. They decided to keep their marriage a secret so after taking their vows, Hervey, a naval officer, returned to the sea, and his new bride went back to her post at court. When Hervey returned from his tour of duty, the couple quickly found they had no chemistry whatsoever. They did manage to produce a son, but the child died when he was just a few months old. Elizabeth and Hervey decided to “separate” in 1749, but, like their marriage, their separation was known only to them. Elizabeth was 27 years old, and at the zenith of her beauty and charm. During the King’s Jubilee Celebration, she (barely) costumed herself as Iphigenia, leaving so little to the imagination that the other maids of honor refused to speak to her. King George II, on the other hand, had no such qualms, and asked Elizabeth if he might touch her breast. She replied that she knew of something that was even softer to the touch, and placed the horny king’s hand on his own head. Luckily for Elizabeth, he was more enthralled than infuriated. Not long after, Elizabeth met the love of her life, the handsome and retiring Evelyn Pierrepont, the 2nd Duke of Kingston-upon-Hull. She settled in happily as the Duke’s mistress, and pushed her unfortunate nuptials with Hervey to the back of her mind. When she was 48, she married Evelyn Pierrepont, becoming the Duchess of Kingston. When he died four years later, The Duke’s family was peeved that he left everything to Elizabeth, meaning none of them would inherit until after her death. While she was visiting Rome shortly after Kingston’s passing, Hervey came into his earldom, making her (at least legally) Countess of Bristol. Kingston’s nephew Evelyn Meadows got wind of this, and demanded that Elizabeth return to England to face bigamy charges. Alarmed, she wrote a letter to King George III asking him to intervene on her behalf, but he was busy dealing with those rebellious American colonies at the time. The trial was a media circus, with tickets a most coveted commodity. Most of Elizabeth’s friends turned their backs on her, and she was portrayed as a calculating gold-digger who tricked a wealthy duke into a bigamous marriage. Elizabeth was found guilty, but still retained the bulk of her fortune. She traveled between St. Petersburg, Rome and Paris, where she died in 1788. She continued to style herself as the Duchess of Kingston, while she was still legally Countess of Bristol, and reportedly remained charming to the end. How sad! We have such trash as the “National Enquirer” damaging our modern lives, and now TIFO / TDIH has to resurrect this purposeless, scandal-related narrative. What a waste of the time of the writer and all readers! This page should be deleted.